Women’s football has evolved beyond recognition in the past couple of years, with the recent Euro Championships in the Netherlands garnering more coverage, attendance and viewing than ever before. Female footballers are finally beginning to receive the attention and respect they deserve, which is reflected in the quality of the games and can only help to promote the sport further in the future. The female national team was founded in 1973, with a current world ranking of 35th indicative of their shortage of success in the ensuing four decades. The team are yet to qualify for either the World Cup or the European Championships. However, with the Welsh Premier League growing in stature season after season, and the sport in general developing at a rapid rate, things are starting to look up for the female Dragons. Wales were drawn into a tough qualifying group for the 2019 competition, alongside rivals England plus Russia, Kazakhstan and Bosnia. After five matches played, Wales are holding their own in 2nd place, with just two points between them and group leaders, England. An epic display of defending rewarded the Welsh women with a 0-0 draw against their rivals, which manager Jayne Ludlow described as ‘probably the best result in their history.’ The high point of the match was goalkeeper Laura O’Sullivan’s incredible performance, who managed to keep a clean sheet with a string of heroic saves. Finishing the group in top place will be an arduous task, although fans will be hoping for qualification from 2nd spot if they fail to topple England. Aside from developing a promising international squad, Wales brought focus to the sport by hosting the 2017 Champions League Final in Cardiff. 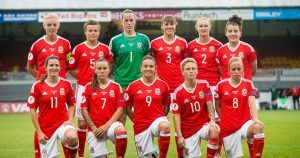 The match was attended by over 22,000 spectators and offered the perfect platform to encourage young girls across the nation to lace their boots and join the fight to put Wales on the map of women’s football.